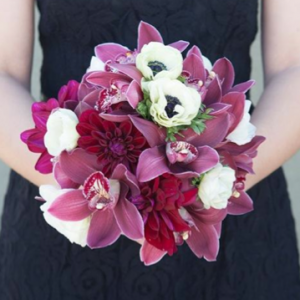 In the spirit of this spooky holiday season, today’s Bouquet Blueprint is bold and dark! 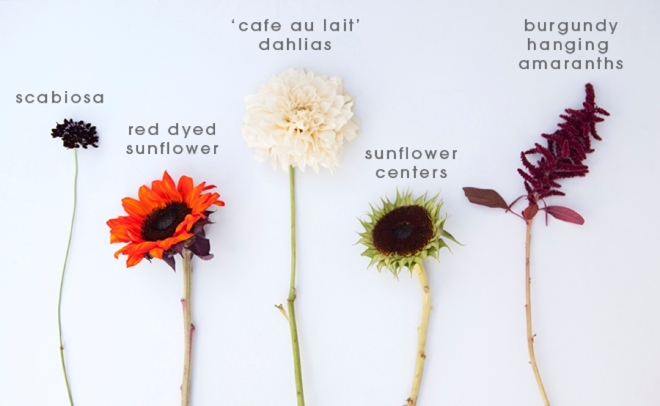 Giant blooms and deep colors make this sultry bunch striking but the real uniqueness is found in the sunflower stems that lack their precious petals. As if Vincent Price plucked them from each flower himself, the giant blackness of the sunflower seed head makes the perfect mysterious addition. They make you take a second look, as if naturally you can see that something isn’t quite right… but in this case that was our intention. Sunflowers are available most of the year however the red dyed sunflowers are most commonly found the end of summer through fall. Dahlia season is winding to a close around the end of October making these “cafe au lait” dahlias perfect for a last pop of summer! When shopping for your hanging amaranths select a bunch that has the shorter flowers. 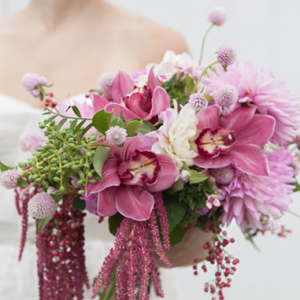 Some hanging amaranths can be very long and dramatic which is a beautiful look for centerpieces however can overwhelm this bridal bouquet. 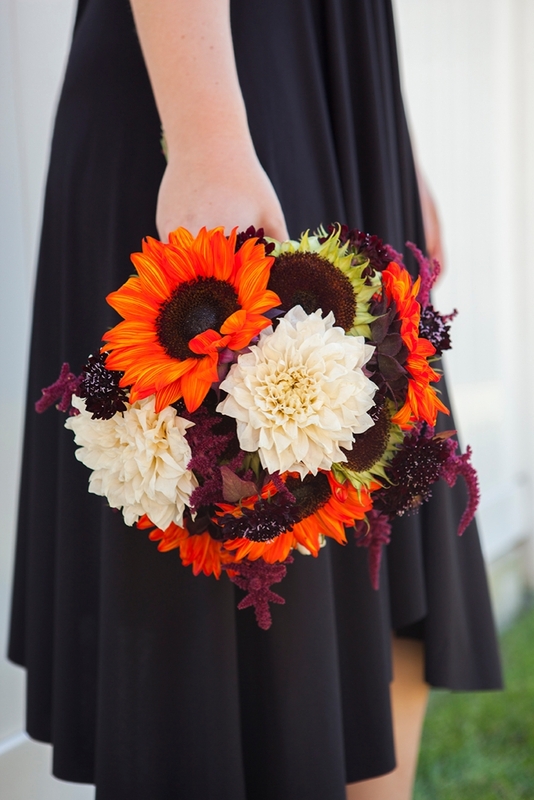 Sunflowers are very hardy flowers making them the perfect base for this bouquet! The dahlias are a wonderful soft element however they do require water. 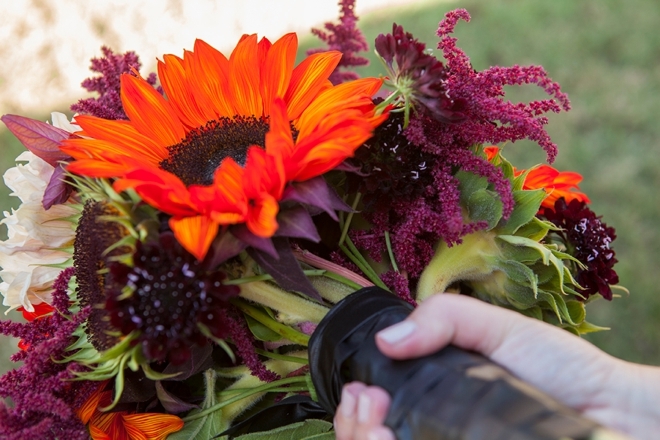 Keep this bouquet in water as long as possible to keep the dahlias hydrated and spritz with water for the extra moisture. 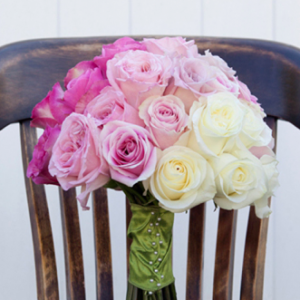 Before walking down the aisle, make sure to dry the stems of the flowers completely and let sit for a few minutes to ensure the stems will not drip on your beautiful dress. 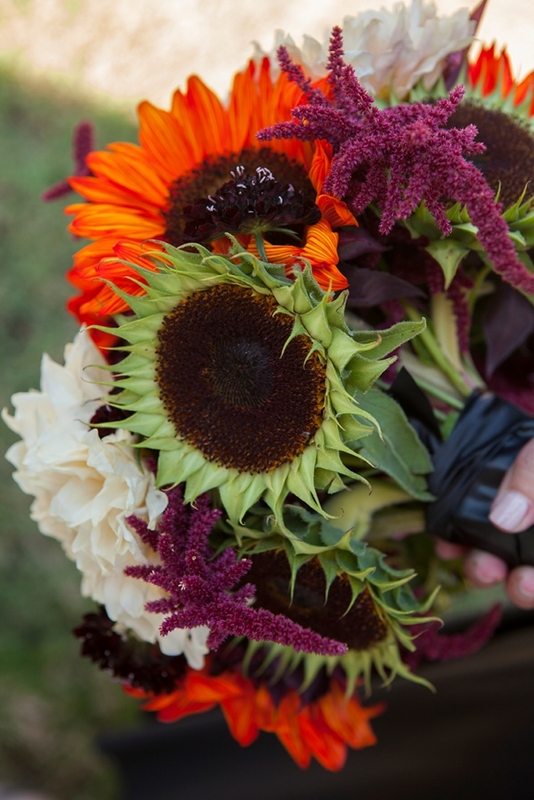 To get the sunflower centers for the this bouquet gently remove the petals of traditional yellow sunflowers. It is easier to remove petals if the flowers are room temperature and the flowers are fully open. 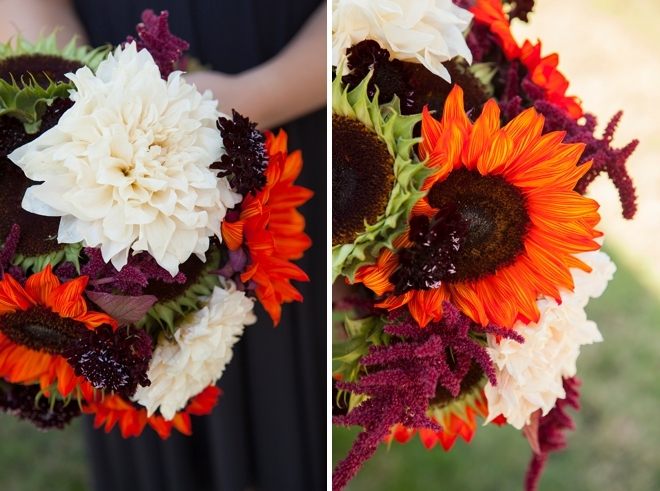 Using sunflowers that are more mature can make it less likely that the petals are going to rip at the base. When shopping for your sunflowers look at the size of the center versus the size of the overall flower bloom. 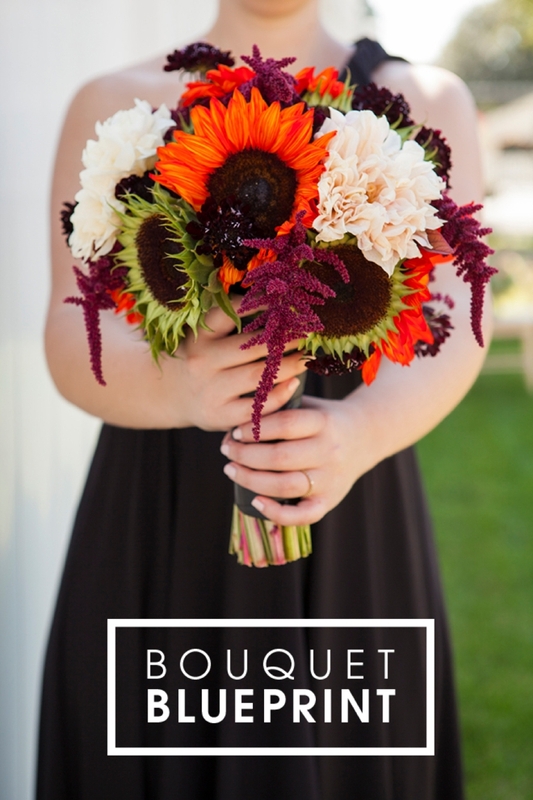 Also since there are a total of 15 sunflowers in this bouquet, try to get stems that are on the skinny side.